Jan Turnovský (1942–95) was a renowned architect and architectural theorist. An exceptionally dedicated teacher and researcher throughout his tenure at the Vienna University of Technology’s Institute for Architecture and Design, he was also the author of the boldly original Poetics of a Wall Projection, where he explores architecture’s many rich layers of meaning. Turnovský’s thinking has been highly influential for generations of Austrian architects, but relatively little documentation remains from his early career, including his nascent forays into architectural theory. 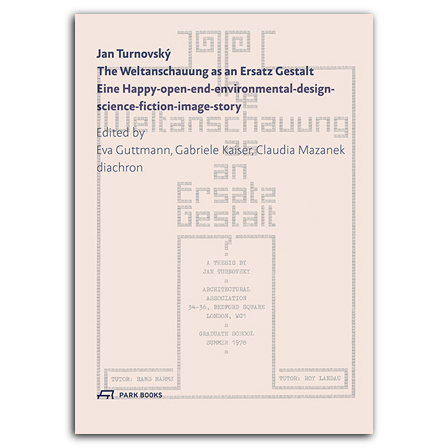 The Weltanschauung as an Ersatz Gestalt was Turnovský’s thesis, written in 1978 as a requirement to complete his studies at the Architectural Association School of Architecture in London. For more than thirty years, it has remained unpublished—until now. This facsimile publication sheds new light on the development of his theoretical trajectory by revealing Turnovský’s interest in the philosophy of “open systems” as proposed by the Italian novelist and semiotician Umberto Eco. Turnovský applies the logic of open systems to the architectural design process, which allows for a personalized perception that may differ from both the collective experience and the creator’s artistic vision. Drawing on this novel theoretical approach, Turnovský offers a new critical assessment of three widely accepted architectural practices of the time: numerical aesthetics, ideology, and semiology. A fascinating work by a highly original theoretician, The Weltanschauung as an Ersatz Gestalt is presented here in facsimile of the original English typoscript with a new introductory essay. is a Vienna-based freelance editor with a special expertise in twentieth-century art and architecture.